The 4 main causes for enlarging leg girth or circumference are lipedema (accumulation of fat in the legs), lymphedema (obstruction of lymph flow in the leg), obesity and impaired venous blood circulation (venous stasis). Lymphedema is observed as swelling that usually involves the feet and shows up as impaired flow on lymphangiograms or lymphoscintigraphy . With time the swelling becomes hard and uncompressible and the skin breaks down and becomes infected. Impaired venous circulation is observed as swelling with brown darkening of the skin color, skin break down and inflammation. The blocked veins are visualized by doppler sonography studies using sound waves transmitted through the skin. This blog will focus on lipedema also known as lipoedema in Europe. The areas of fat concentration tend to be abdominal in aging men, hips and thighs in aging women and buttocks in certain races as those individuals age. The age at which this occurs varies from person to person. Changes in metabolism and fat deposition can also occur more quickly at puberty, after childbirth, gynecologic surgery, with the onset of thyroid disease or menopause. It is easier to lose fat from areas in which your body tends to not concentrate fat. The fat doesn’t go to one place and then another as in first, second etc.. It goes all over but more of it is stored in specific areas and it is mobilized from other areas more easily. In some cases the concentration can be dramatic such as very large buttocks with skinny arms and legs, steatopygia, which is more common in certain African tribes. In some Caucasians, predominantly of European decent, the concentration can be greatest in the upper arms and thighs or entire legs and has come to be known as lipedema. It can be very hard to lose the fat in these areas of high concentration by weight loss diets. 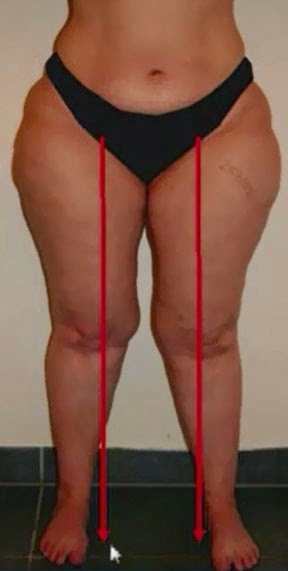 Lipedema is characterized by being almost exclusively in women, it can be inherited, it occurs independent of weight (but obesity is an important risk factor for its severity and prognosis), it is symmetric bilaterally with visible sharp demarcations of fat accumulation vs. nonaccumulation at the ankles, elbows and or waist, it does not diminish with limb elevation, it cannot be diminished by diet or exercise due the high fat concentrating abilities of hyperplastic fat deposits and it spares the feet and hands. In the early stages the legs can seem disproportionately large compared to the rest of the body. 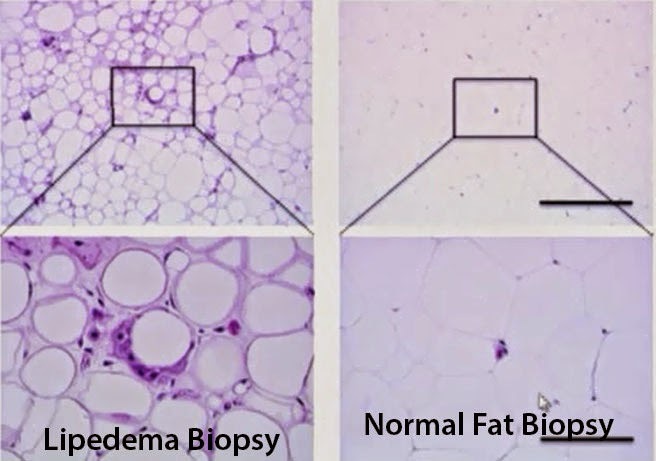 Comparing fat in a leg with lipedema vs. a leg with normal fat under the microscope we see more fat cells per square inch, cells that are more round and more purple staining material between the fat cells. That material consists of inflammatory and scar cells and the substances produced by those cells. Aids for making the correct diagnosis are (duplex) sonography to rule out venous stasis or thrombosis, the waist-hip index or the waist-height index and lymphoscintigraphy to rule out lymphedema. None of which were documented or performed in this patient. It is unclear if lipedema is just early lymphedema or a cause of later lymphedema. Some believe that the lipedema process affects nerves and blood vessels as well as lymphatics thereby being a cause of chronic pain, easy bruising and progressively restricted mobility. The pathophysiology of that is unclear as diminished use of a limb alone can cause chronic pain syndromes. The mixing of lymphedema and lipedema patients in many published treatment studies invalidates their conclusions. There is no data to support the treating of lipedema over or before obesity in those patients who have both. At the more severe Stage 3 the weight distribution when standing becomes concentrated on the inner half of the foot and the below knee part of the leg splays outward leading to ankle and knee joint problems. The symptom-based therapy of lipedema consists of conservative (compression, complex decongestive physiotherapy, manual lymphatic drainage, exercise) and surgical treatments (liposuction) but there is no cure. Some favor water assisted liposuction while others favor laser assisted liposuction. This is basically the same treatment protocol employed for lymphedema and just like lymphedema the surgical treatment is only medically necessary in more advanced cases after complete evaluation and treatment of other contributing factors. Very interesting discussion of what can cause larger legs. Knowing what the cause is can help decide if surgery is needed, and if so, what kind. Thanks for sharing this information!